Nicola Sturgeon has announced a new link-up between Scottish and Icelandic tourism bodies during a conference in Reykjavik. The first minister is in Iceland to address the Arctic Circle Assembly on the topic of climate change. She also announced the signing of a memorandum of understanding between VisitScotland and the Icelandic Tourist Board to share information. Other speakers at the event include UN Secretary General Ban Ki-moon. About 2,000 delegates from 50 countries were expected to attend the conference in Reykjavik, which is concerned with the development and protection of the Arctic region. The agreement between the Scottish and the Icelandic tourism boards will see them share information and advice on areas such as quality development and sustainability. Ms Sturgeon said: "Scotland and Iceland are world-renowned tourist destinations and we share a common interest in developing a sustainable tourism sector that continues to excite and attract visitors. "New direct air routes between our two nations started earlier this year, so it's a fitting time for VisitScotland and the Icelandic Tourist Board to deepen their collaboration, learn more from each other and enhance the tourist experience in both of our countries in the coming years." The agreement will lead to collaboration on tourism development, boosting film tourism and making the best of digital markets. Malcolm Roughead, chief executive of VisitScotland, said: "Both Scotland and Iceland are small countries that punch well above their weight on the global stage. "Tourism is a key driver of the economies in Scotland and Iceland, with the industry providing a lifeline for our nations during difficult times. VisitScotland and the Icelandic Tourist Board have built a strong and mutually beneficial relationship over the past three years and it's exciting to take this to the next level with the signing of this agreement." Ólöf Ýrr Atladóttir, chief executive of the Icelandic Tourist Board, said: "Icelandic tourism has been going through enormous growth in the past years. "Such growth inevitably brings with it new challenges that need to be addressed. Scottish tourism and VisitScotland have a multitude of experiences that we at the Icelandic Tourist Board have been able to learn from and we believe that the signing of this agreement will benefit both countries in years to come." Ms Sturgeon was invited to the Arctic Circle Assembly by former President of Iceland Ólafur Ragnar Grímsson following the Paris Climate Change talks in 2015, and will take part in a full day of meetings and engagements. 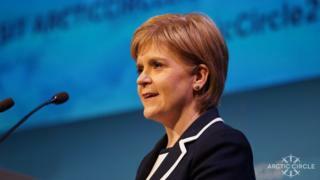 The first minister said climate change was "one of the biggest challenges the world faces". She announced £1m of funding to support developing countries track and measure the impact of climate change. She told delegates: "We know the most damaging effects of climate change are in developing nations and fall disproportionately on the very young, the very old and the very poor. "That's why Scotland was the first national government in the world to establish a Climate Justice Fund, which now supports 11 projects in some of the world's poorest communities in four sub-Saharan African countries."